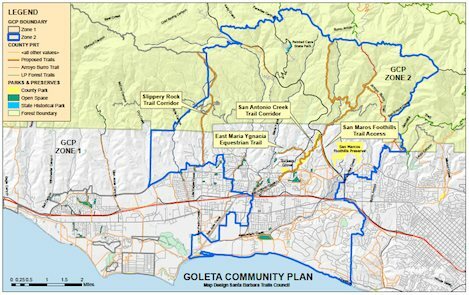 Map outlines boundary of Goleta Valley Community Plan area and several initial proposals for new trail access in the Goleta Valley. The Trails Council is seeking input on additional trail access within the planning area and in other parts of the community. This coming Tuesday, November 10, the Santa Barbara County Trails Council is sponsoring a public workshop at the Goleta Valley Community Center from 7 to 9 p.m. The Trails Council is a nonprofit, broad-based trails advocacy group that has worked cooperatively since 1969 with local, state, and federal agencies for planning, maintenance, and construction of existing and new trails. Ford also noted that it is the Trails Council’s hope that by gathering information from public workshops that the county can utilize this information to expand and improve the current trails system available to the Goleta community. The Trails Council also wishes to facilitate coordination between the City of Goleta and the county on trails planning, construction, and maintenance. The meeting will be informative and provide trail history, maps, and status updates of major trail planning proposals. Please plan on attending and providing the Trails Council with your input for trails on November 10, 7 p.m. at the Goleta Valley Community Center, 5679 Hollister Avenue, Goleta. In the interest of full disclosure, along with his duties as executive director of the Trails Council, Ray Ford is the Outdoor Editor for The Independent.